Toradora! is one of those rare series that provide a slice of life story which hooks any audience from the get-go. Toradora! is a series that can be successfully enjoyed regardless of your tastes in genre. The development of the main characters allows the viewers to deeply care about the outcome of their stories. Furthermore, as the series progresses into its second part, the show goes into high gear feeding from a strong story and cast of characters that are backed by an impeccable voice acting. Toradora! is a masterful execution of an high school drama and slice of life (and maybe the best one out there) that teaches how character development is supposed to be done. Hoping for a movie. Extremely recommended. An unrequited love story (stories, really) played straight. The protagonists are neighbors and classmates with sympathetic backstories and good intentions towards their love interests. I enjoy stories like this where everyone's intentions are genuine and positive, yet everything gets messed up nonetheless. It ain't over 'till it's over. Watch past the closing credits. This anime is fantastic...if slightly uneven (much like a certain profane parrot). But I loved and love it (parrot and anime) so much so that I can forgive all its weaknesses and embrace the cooky-sweetness that is Toradora. Ok ok, I guess you needed more convincing... Well the characters are extremely likeable, starting off with the misunderstood Takasu Riuji and then is matched with the adorable Palm Top Tiger, Aisaka Taiga. Phenomenal Duo which I believe remains unparalleled in love story anime dramas. Now enough reading and enjoy that first episode!! The best romantic-comedy to date. In today's industry there is an over-saturation of Slice of Life and tsunderes. If Haruhi Suzumiya was the first fully realized slice of life anime with a tsundere character then Toradora is the one who popularized it. Each of the characters is very unique and inspired many similar characters thereafter. Rie Kugimiya did such a fantastic job as Taiga Aisaka that she is now the definitive tsundere actress. Let me get to the actual points on this review though. Story: It's a pretty typical anime story. Misunderstood scary kid who doesn't really care about anything, tsundere girl, yandere girl, etc. Ryuuji, a high school student with really scary eyes, is labeled a deviant based on his appearance. There are all sorts of rumors flying around about how he beats up entire gangs. Then there's Taiga Aisaka, a very short cute girl with a bad temper. Ryuuji and his friend Kitamura, athlete and student council vice president, sit next to each other in class. Taiga, who has a crush on Kitamura accidentally puts a love note in to Ryuuji's bag. In an attempt to save himself from Taiga's wrath they make a deal. Ryuuji will keep quiet about the letter and help set Taiga and Kitamura up if Taiga helps Ryuuji get with her friend, Minori. The story evolves in to a love polygon for the ages. Animation: Better than most. Movement is fluid and for the most part, natural. The art style is very clean. Voice Acting: phenomenal, as I said before, Rei did so well on the roll that now she plays like every tsundere character ever. TL:DR there is no reason not to watch this show. This series is known for Rie Kugimiya's superlative performance as Taiga, but all of the main characters are memorable. A lot of developments or scenarios that seems like obligatory cliches turn out to be so much more; what may seem like a chance to put the characters in swimsuits leads up to one the greatest moments in anime. I notice that the series is tagged as Seinen and Shojo; it is a really good show to watch with a partner who is not otaku. The series is cramming 10 light novels in to a single season; you might want to read the books on baka-tsuki first (or afterwards). 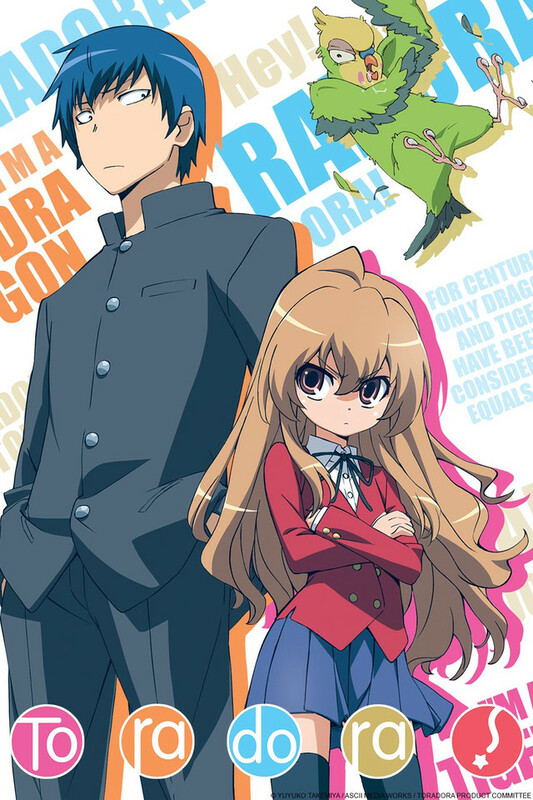 I personally thought that Toradora was one of the best romance anime I have watched to date. It is well written and woven together. It is a must see especially for you tsundere fans. The main female lead, Taiga, is played by none other than the queen of tsundere herself, Rie Kugimiya.